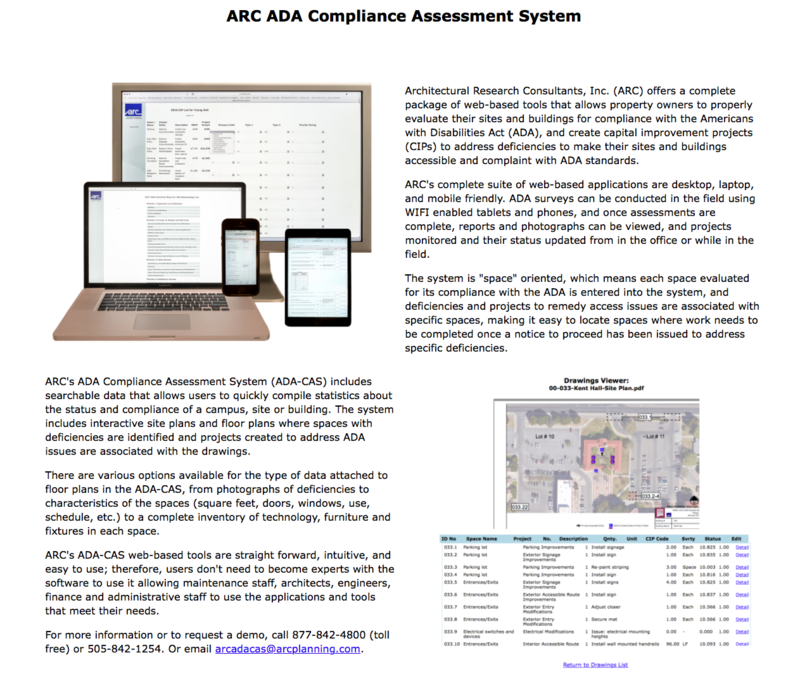 Architectural Research Consultants, Inc. (ARC) offers a complete package of web-based tools that allows property owners to properly evaluate their sites and buildings for compliance with the Americans with Disabilities Act (ADA), and create capital improvement projects (CIPs) to address deficiencies to make their sites and buildings accessible and complaint with ADA standards. 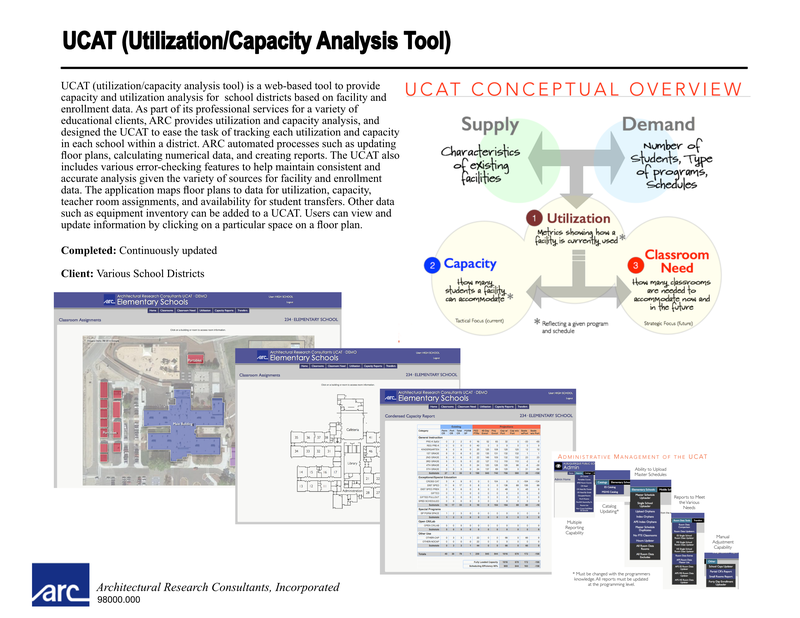 For our utilization and capacity analysis services we developed UCAT, a web-based computer software program with a graphical, user-friendly interface. 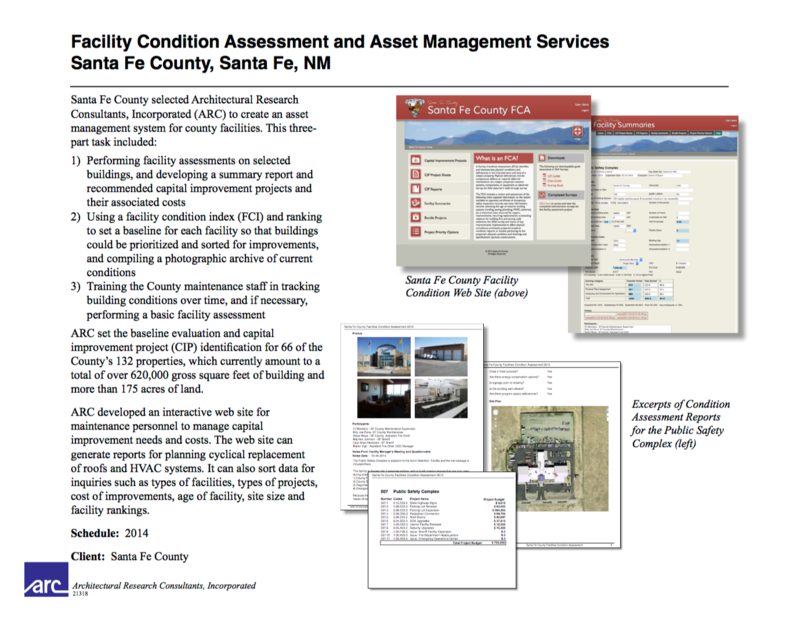 A Facility Condition Assessment (FCA) identifies and characterizes physical conditions and deficiencies in the improvements and land of a subject property. Physical deficiencies include conspicuous defects or material deferred maintenance of a subject property's material systems, components, or equipment as observed during the field observer's walk-through survey. 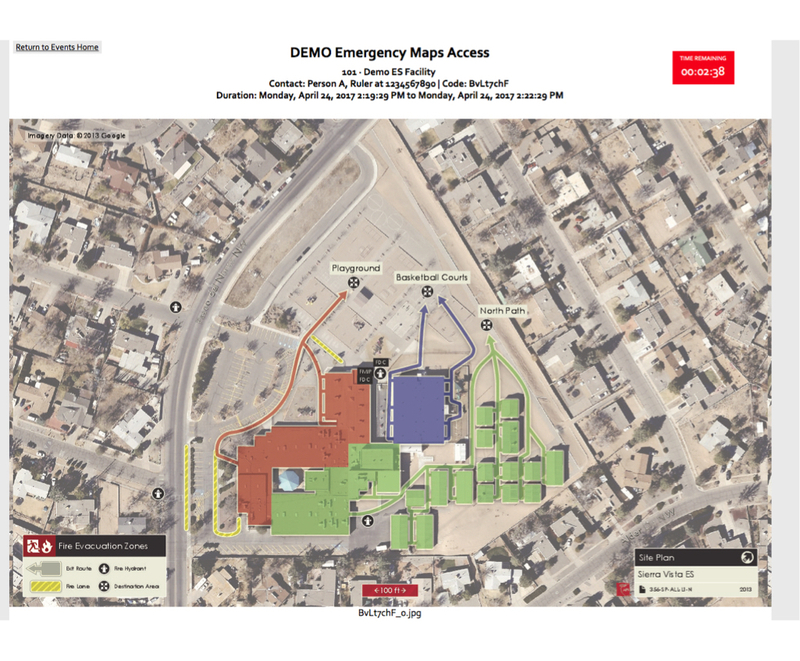 Emergency services mapping is a web-based system that allows facility managers to give first responders timed and limited access to floor plans, site plans and fire escape plans to help first responders work more effectively in an emergency situation involving a single facility or multiple facilities. 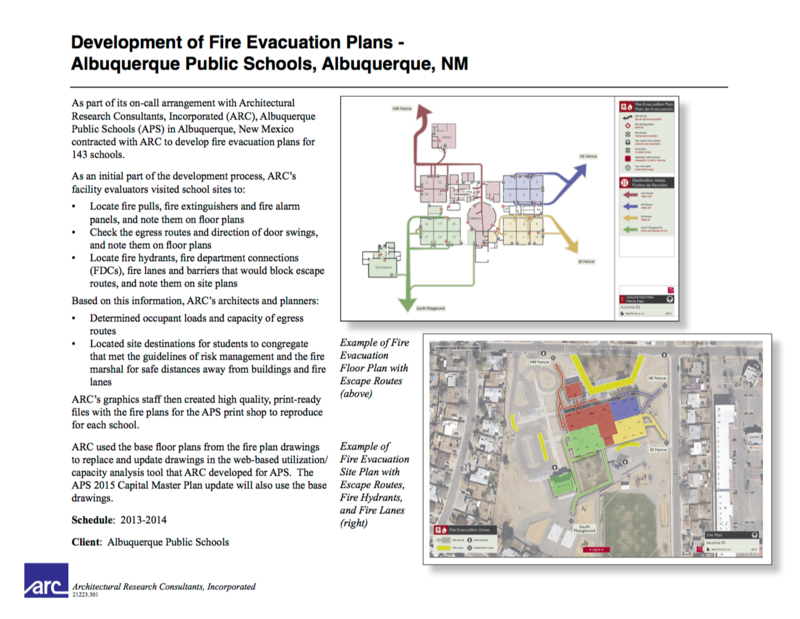 ARC staff creates fire escape plans by assessing the occupant load of each area, capacity of egress routes, barriers to safe egress and access to designated gathering areas. 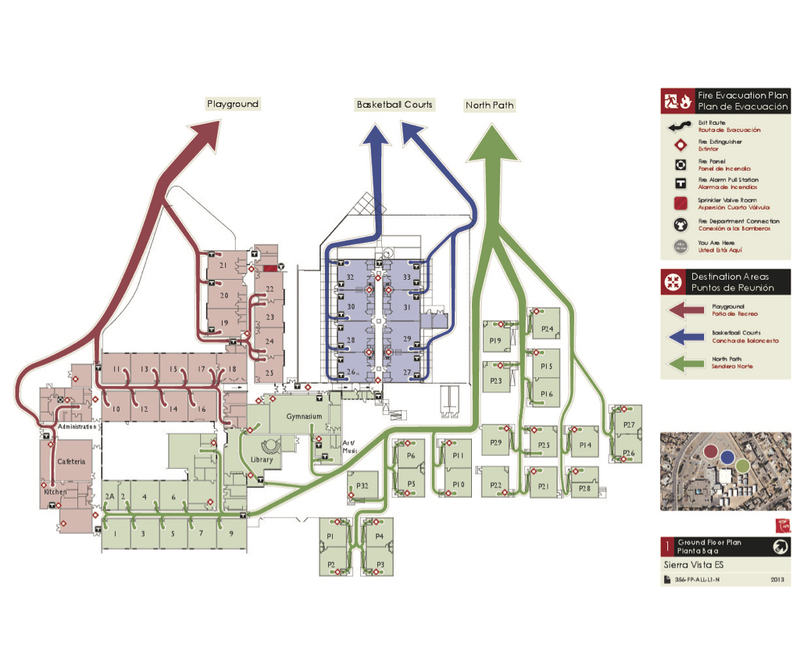 ARC staff works to assure that final egress routes and gathering areas meet the requirements of client's policy, risk management and the local fire marshal. 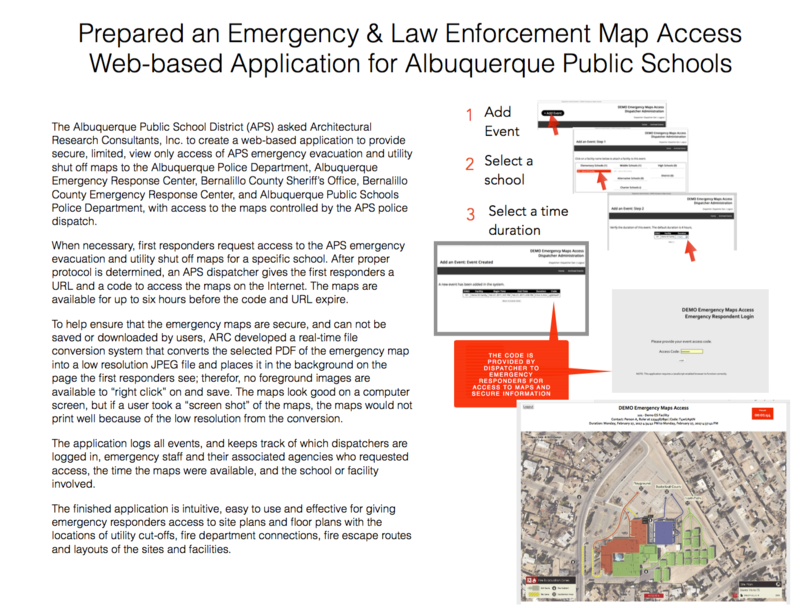 ARC specializes in facilities master planning for educational institutions and we are the acknowledged leader for these services in New Mexico and the southwest region. Our planning efforts encompass the entire facility planning cycle with a focus on pre-/post-design activities. With this unique perspective, we provide you with specialized assistance in making the prudent decisions that affect your long-term planning. ARC is a unique architectural consulting firm specializing in the areas of planning, architectural programming, facility evaluation, and architectural research. 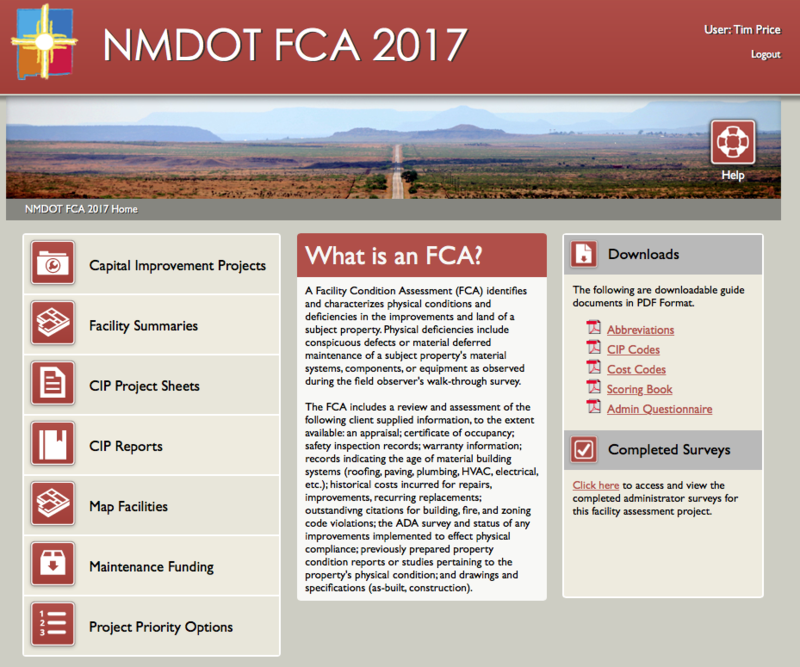 Founded in 1976, it is the largest and longest-established firm in New Mexico specializing in planning. Since its inception, ARC has provided services to numerous federal, state and local governments in urban planning, land planning and the planning of office, educational, health and specialized facilities. Over time, we have refined and honed existing processes and procedures, adopted and developed new services and pioneered new technologies. 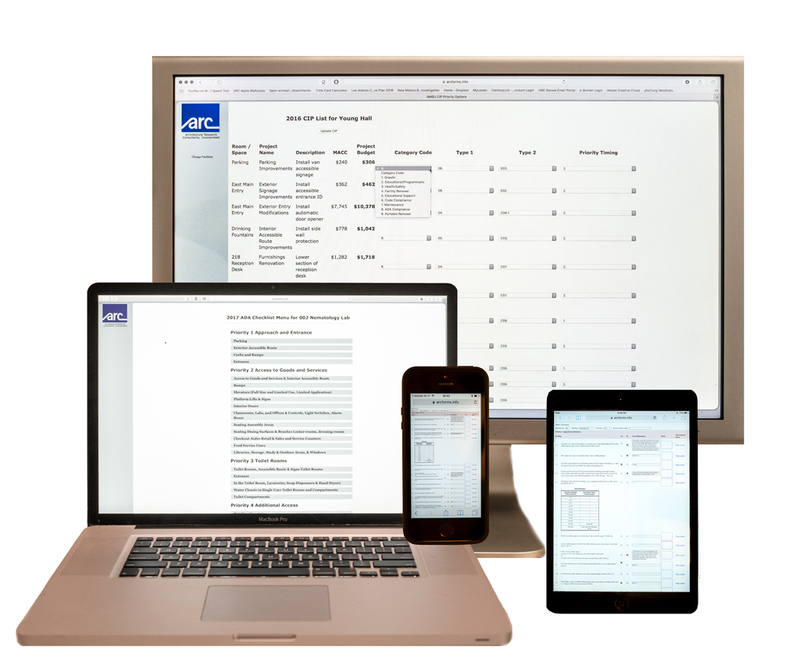 Many clients have come to rely on the accuracy of ARC's data and its translation into rational policies, recommendations and decision making. More than 80% of ARC's business has been for repeat clients, which include the State of New Mexico, Sandia National Laboratories, the National Park Service, University of New Mexico, New Mexico State University, and Albuquerque Public Schools. ARC's staff members bring unexcelled experience in facility master planning, facility programming, urban and community planning, and facility evaluation. 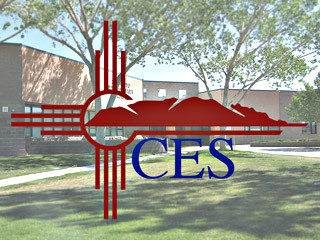 ARC is a member of CES. 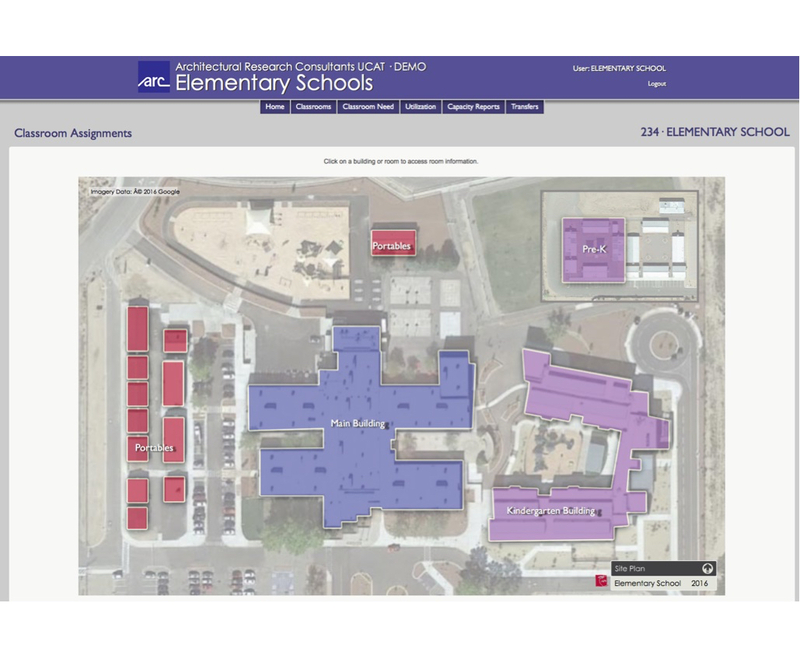 Architectural Research Consultants, Incorporated is a member of Cooperative Educational Services (CES), a purchasing cooperative united by a joint powers agreement to aid public schools in New Mexico. Member institutions and participating entities in New Mexico include all New Mexico School districts, charter schools, higher education institutions, and many cities, counties, and municipalities. The cooperative has an established professional services program that provides members with a nucleus of trained personnel to meet consultancy or contract position needs. We offer Educational Facility Evaluation, Capital Outlay Long Range Planning and Project Management, and Professional, Consulting, Miscellaneous and Related Services including architectural planning and facility programming through CES. Member clients can contract with us without staging a Request for Proposal process. CES members also receive a discount on our fee. Copyright © Architectural Research Consultants, Inc. ARC, Inc. is solely responsible for the contents.